In this picture of 3C273, we can see a jet—estimated to be around 200,000 light-years long—being emitted. I'm trying to find an estimate for the mass of the jet. It's a stream of electrons, accelerated through synchrotron radiation (see here). There seems to be lots of information on its spectroscopic properties and the mass of the quasar (886 million solar masses), but I can't find an estimate for the mass of the jet itself. Does anyone know of a source I could look at to give me some idea? Trigger Warning: Major hacking going on here. [edited from 1 ly to 1000 ly diameter] Scaling from the image, I'll approximate the jet diameter as 1000 ly . So there's a volume of roughly 2e4*1e6 * pi/4 cubic ly. For absolutely no good reason, I'll propose an electron ejection density of 1E6 per cubic km -- at least those are round numbers and easily scalable if anyone can find references to actual calculations/measurements --, so using 1 cubic ly = 8.468e+38 cubic km, I get 1.33e+56 electrons in the jet. Not the answer you're looking for? Browse other questions tagged quasars reference-request or ask your own question. 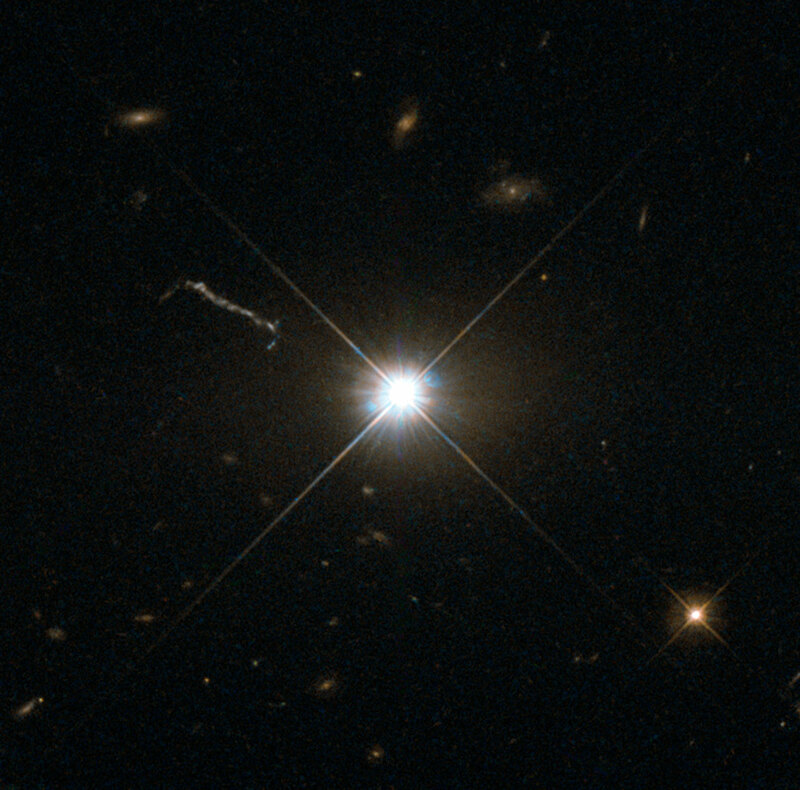 What is the scale of things you can see with gravitational lensing?